The integration of apps within our publications’ editorial content will be accomplished through strategic alliances with the countless app developers responsible for populating the Apple and Android App stores. This inclusion of apps in our editorial content creates sustainable value for readers, providing them with articles, stories and features that are vibrant, highly interactive, and functional. This new form of partnership with app developers is unprecedented and is not being done by any other publisher today. 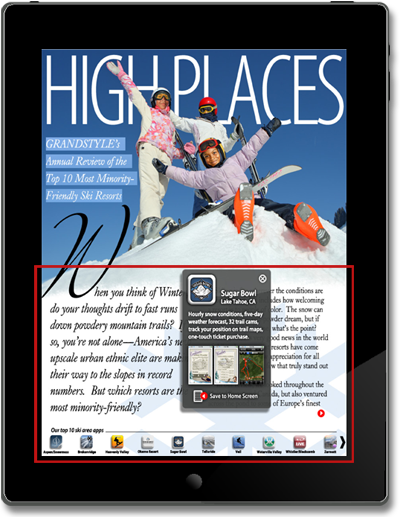 Example article illustrates simple way of integrating “Apps” to enhance a story. String of Apps is specially related to the story. T-ZINE MEDIA in the future will strongly attempt to partner with mainstream tablet manufacturers (Apple, Amazon, Dell, HP, and Samsung) that allow us to integrate and prominently feature our digital publication apps on their devices providing a stronger and more effective market presence for our digital publications. It also benefits the manufacturers in promoting their interactive tablet devices to specific target audiences.